Can you Help Find Frank? Anna Gerbanas has advertised on a billboard in a desperate plea for any information about her beautiful dog who was stolen from their Logan Reserve home. Frank is a gorgeous French Bulldog who has been missing since the 2ndFebruary. Yes, we say ‘who went missing’ because Frank is just like a family member to his heartbroken owner. Anna fears for Frank’s wellbeing. She returned home after a few hours at her birthday celebration to find her beloved pet had been taken from her backyard. Frank’s theft was reported to Police before Anna launched herself into a campaign to help find Frank. As well as the billboard, Frank’s profile has also been included in a letterbox drop, door to door appeal for information, Facebook and even television. CEO of Bishopp’s (Brad Bishopp) emphasises that Frank’s disappearance is a reminder for people to only buy from responsible and registered sources. 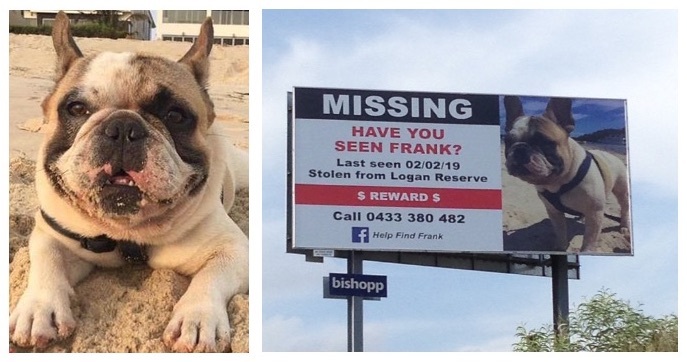 It was quickly evident how dedicated Anna was to finding Frank and recognising her plight, Bishopp’s included images of Frank on other signage around Brisbane to help spread the word. Hopefully the extensive campaign will create enough pressure on the thieves to return or surrender Frank so that he can be reunited with his rightful owner, Anna. If enough awareness is raised, then it will be difficult for those responsible to sell the dog due to so many folks being aware. Dog theft is not only limited to specific breeds. Pet theft should be reported to Police. Register any missing pets with the RSPCA as they can help you in a number of ways to search for your pet. Always keep a current pic of your dog handy along with microchip number etc. The more eyes out there looking for Frank, the greater the chance he will be returned safely home to Anna.